Terror attacks. Natural disasters. Product failures or contamination. A lot of things over which business owners may have very little or no control can go wrong. These situations can have a lasting impact on a company’s reputation or bottom line if handled poorly. And yet, many organizations are completely unprepared for even the most minor of crises (if you can call any crisis minor). Let’s talk about some of the things you can do to change that for your company or organization. Being ready for a crisis situation involves considering all possible scenarios and planning for the worst. But it also means considering how to protect your business and your people. 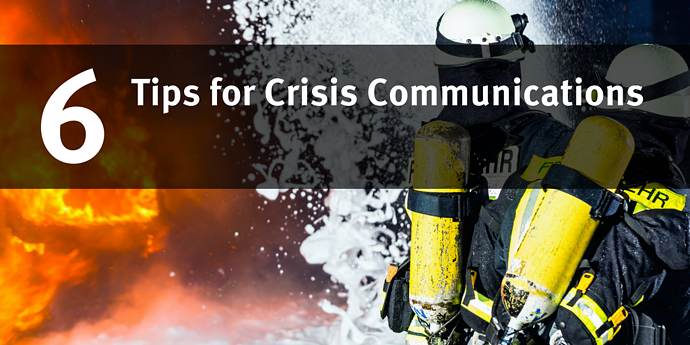 Here are six essentials tips for crisis communications management. 1. Assess critical operations and weak points. A business analysis and risk assessment will enable you to better understand your organization by documenting your key products and services; the critical activities required to deliver these; the impact that a disruption of these activities would have on your organization; and the resources required to resume the activities. List the key products and services your organization provides that, if disrupted, will have the greatest impact. For each product or service identified, you should consider what the impact of a disruption would be both in terms of your organization’s ability to meet its aims and objectives, and the impact on its stakeholders. What are your organization’s key products and services? What are the risks to these critical activities? How will you maintain these critical activities in the event of an incident? The first rule of crisis communication is to be ready for anything - and everything. Think through all the possible situations that could go wrong. What are some common ones? Your crisis management plan may include information about contacting authorities in certain situations, or chain of command within the company for how certain information is distributed, evacuation plans or community outreach plans. It may include knowing where to put file backups and how to ensure the security of your building or intellectual property. What do you do if the power goes out and you need to get your messages out or reach people in the field? Another possible damaging situation is when personal or sensitive information about a member of the senior management team gets out as this can have a negative impact on a brand. Your company needs to be prepared to handle situations like that, to show a unified front, and to make sure that everyone in the company is on the same page about how to respond. Think about your brand and what your messages are. You need to present a consistent front. A news reporter speaking to one member of your team should not get a completely different answer from another employee. Also, remember that you’re talking to people. Be human. Have a sense of humor. Remember that people make mistakes and that’s OK as long as you own up to it and show that you’re taking steps to correct a situation. The preparation may include media training…how to speak in front of a camera or to the press, the kinds of questions to answer and what to say (or not to say), and when to redirect a topic to a different, more appropriate member of the team. You need to factor in training for different kinds of media as well. Interviews with a blogger or online news site will be very different from a TV morning show or being interviewed live on the evening news with the BBC. Make sure your assigned spokespeople know what these differences are and how to manage them. Which comes to another point. Have assigned spokespeople. This could be the CEO in certain situations, but often, it’s not. A public relations specialist or the head of a department might be more appropriate, and more informed, about certain topics and thus able to provide a more authentic and honest reply. However, you also need to make sure your people have the right sort of training to know how to calm a situation and provide reassurance that your organization has (or is getting) things under control, or that you are making a coordinated effort to remedy a situation, rather than pouring fuel on a fire. One example that comes to mind is when I was working in Southeast Asia with the World Health Organization. Several natural disasters including a Tsunami and outbreaks of various diseases such as Avian Flu occurred. A colleague mentioned the word “pandemic” to the press which turned what was a controllable situation into an international panic and many weeks of extra work to regain confidence and control. 5. Be proactive not reactive. If something does go wrong, help your company stay in control of the situation. Be proactive. Hold press conferences. Write press releases. Make sure everyone internally and externally knows: What is the crisis? What happened? What are we going to do? What have we done so far? Who does what? Keep in mind that if someone else thinks there is a crisis, and you don’t, you need to investigate it. You need to take it seriously and have a well thought-out response. Don’t just think “that’s rubbish” and ignore it. Somehow, this idea got into someone’s head. And if it’s in one person’s head, with today’s social media landscape, it will soon be in many other people’s heads. For example, consider the damage done to the United Airlines brand after videos of a passenger being forceability removed due to over-booking were released on social media. Be aware that in crisis situations rumors spread easily. It is important to keep a track of these rumors and correct what is incorrect and always remind people not to spread information that’s incorrect. Always be critical of the source and have a response ready. But not only do you need to have an emergency or crisis management plan, you need to practice it. Showing that you are prepared and have a crisis management plan could have a positive impact when negotiating rates with your insurance company. The worst thing you can do is to have no plan at all. Don’t bury your head in the sand and think the unthinkable can’t happen in your company. The second worst thing you can do is to have a plan but never put it into practice. Creating a polished crisis management plan and then locking it away in a filing cabinet is not doing anyone any good. Your employees need to know what to do, who to talk to, and what to say or not to say when certain situations arise. Everyone from the frontline assembly worker to the CEO should have training on what to do when emergency situations of all kinds happen. One example of great results from practicing is the police response after the recent terror attack in Sweden, as the police had practiced just a week prior to the incident and hence it was fresh in the mind. That could be a bit of a joke, right? (CYA?) But the key to effective crisis communication is to plan ahead to secure your assets (including both physical and intellectual property as well as your brand image), train your people about what to do, and have a consistent, honest message that shows your organization is ready to do the right thing. Keeping these tips in mind will help you create a crisis communication plan that protects your company’s most valuable assets, including your brand image. If you have questions or want more information about Crisis Communications, you can feel free to reach out to Charlotte Wibäck at charlotte@upthereeverywhere.com . We can create a custom crisis communications workshop for your needs.